When you are working with children one on one, you'll start noticing things that you may have not noticed in a classroom setting before or come up against stuff that you can't seem to help your student overcome. As a reading tutor, I plead with you to please read Overcoming Dyslexia by Dr. Shaywitz. For me, I read this book many years into my tutoring and wished I would've had the information sooner to help some of my previous students. I recommend this book because 1 in 5 children have dyslexia. You will come across dyslexia as a tutor. You need to know what to do. When I spot some of the signs, I recommend to parents that they see a dyslexia tutor. Parents are rarely offended at this, but relieved they didn't waste a bunch of money on tutoring with me. It's not that we couldn't have made progress together, it just wouldn't be intense enough or in the right sequence for that child. I think having other tutors that you feel comfortable referring to is an important part of serving your clients. Check out some of these lists for dyslexia tutors. I really like using Let's Go Learn assessments because it gives me clear diagnostics about what the child doesn't know. The reports are very detailed and help me make an informed plan for each child. DORA Phonemic Awareness and DORA K-12 are the reading assessments I use. If the child is 1st grade and younger, I will use both assessments. If they are 2nd and older, I will do just DORA K-12 and then look at results. If they scored low on Phonemic Awareness, I will decide if I should do the DORA Phonemic Awareness assessment in addition to that. If I do see that phonemic awareness is an issue, this causes a red flag to pop up for me. Proceed with caution and start looking for signs of dyslexia listed in Overcoming Dyslexia. Any hesitation while forming letters. Most kids will write An. It doesn't register that Ann is a name. The word “like” may have a “c” and no “e”. Then I'll include a sentence that has two more words that are fairly common sight words. A dyslexic child will may fumble through simple sight words, but may be able to read bigger words like “butter” or “little”. This is because there is some sort of picture associated with it in their mind, whereas the word “the” doesn't bring up any picture. Some professionals believe that dyslexic children are very good a visualization which is why a child can read “tyrannosaurus”, but not “was”. You can watch a free webinar about visual thinkers here on the site. 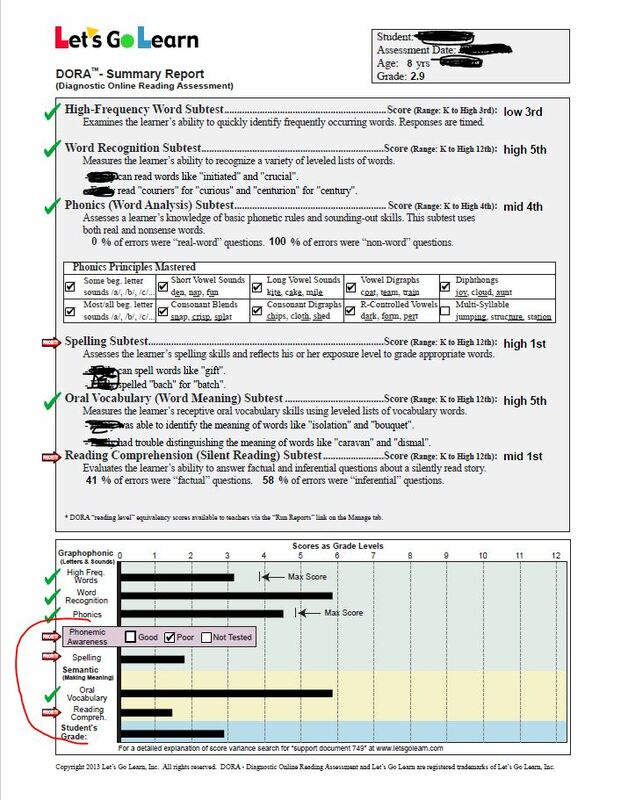 Side note about the report above: Looking at this report now, I can honestly say I didn't know the signs of dyslexia. In reflection, I would have made a referral had this student come to me now. After working with her for several months, I can see now how she would have benefited greatly from dyslexia tutoring. She made enough progress however, that we moved onto working on math. The very last item I like to collect during a reading assessment is an audio recording of the student reading a book at grade level. Reading progress can be so slow that it can be difficult for family members and students to remember where they began. Throughout tutoring, we will take recordings to get snap shots of how they are progressing. My students love to hear themselves progress over time and use this audio recording as a form of self-assessment to improve each time they read. After the assessment, I go over the results and then make a plan of action based on the detailed report that DORA gives me. I pull out a planning sheet that I've made that has six different blocks on it. I like to make a general plan for several months and then plan each week according to my overall plan. This is kind of like creating a scope and sequence. The below picture is for a plan summary I made for a student during the summer coming twice a week. The items I put into the summary are things I got from the assessment itself and from listening to her read. I also like to list the books we'll be reading during tutoring for the parents to reference. You'll also notice that I made a suggestion that the parent purchase Let's Go Learn's Reading Edge program. If the child is only going to come to tutoring once a week, I suggest that they use the Reading Edge program for additional practice at home. The program takes the results of the assessment and plugs it into the program. The reading program only works on the weak areas in a fun way. Students can earn badges and as a tutor, I can see in the back end how often they are getting work done and where they are at in the program. Reading Edge was developed by reading specialists and is developmentally appropriate for lower and upper elementary. The theme of the software has kind of a retro vibe, which is neutral enough that all of my students like it. I pass the fee to purchase onto the parents. In addition to this summary, I will go back into Let's Go Learn and find the students Lexile reading level from the report. Remember though that any leveling system has inherent variance built into it. Students' interest will affect how easy or hard any given text is to read. Furthermore, student motivation will affect their performance during assessments. If they don't try their best, reading levels may be reported lower than their actual levels. I always work on fluency as well and don't have that written up above in this plan. Once I feel confident about the summary plan, I send the Let's Go Learn report and summary over to the parents via email and schedule a call to talk about my plan to help their child. During this call, we talk about the plan and what they can do at home to support their child. I introduce them to the idea of Hot Spots from Laura Candler. I want reading to be enjoyable for parents so we use Hot Spots as a way for them to communicate moments of frustration with me as the tutor. Each time the child comes back for tutoring, I record the Hot Spot words from the week. Over time, I start to see patterns of words we need to work on. It's a great form of ongoing assessment. Each week, I make plan and use my plan summary to guide me as well as any data I've collected like the hot spots or running records. Below is an actual lesson plan from the summer with the student featured above. 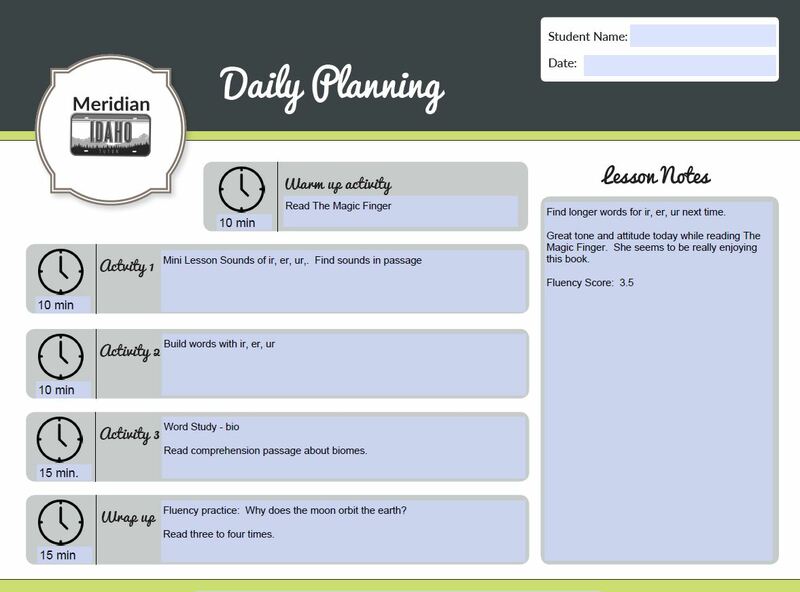 The format of this lesson planning sheet is available inside of the Profitable Tutor Framework. I break my lesson into 5, 10, and 15 minute chunks of time. We do something enjoyable at the beginning which is just reading together! I love putting it at the beginning because most students come to me hungry and need a little snack. This is a great time to much and enjoy a book together. We follow the pattern of me reading a page and then the student reads a page. My students love to hear me read and I enjoy it too. At the end of our book time, we talk a little about the story and make predictions of what we think will happen next. I usually let the child select the book because this is all about bringing the joy back to reading. This is taken from the plan summary above. I find different activities around the sounds and do word building activities that involve tactile things like writing and such. 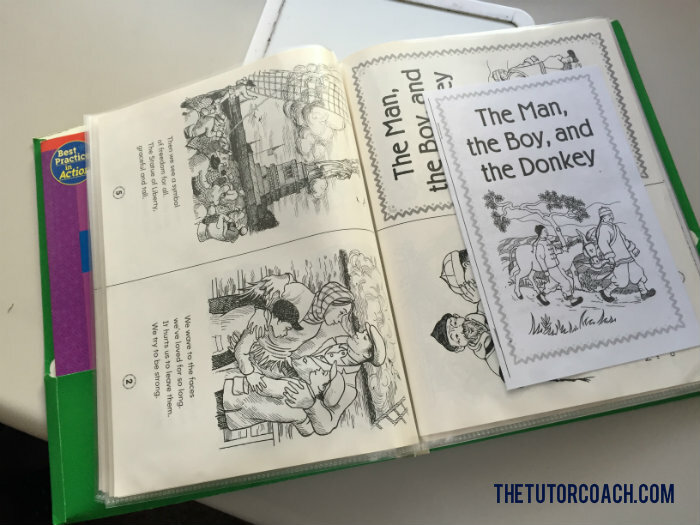 Morphology can be a powerful tool and one that I like teaching reading with. When we understand the building blocks of our language, it makes it much easier to learn how to read and improve comprehension. I involve my students in data collection because they love to see the progress and crave the feedback. For example, I give a fluency rating to each of my students. When I tell them what their score was, I explicitly tell them what they could have done better to get a four. I love using these mini-books from Scholastic. I keep the originals in a folder with sheet protectors. Inside of each sheet protector is a copy of the mini book. I don't send copies of the books home to help me save on the cost of printing. After each reading, I do ask students questions about the books and passages we are reading. For a more formal assessment, grab free comprehension passages from K12 Reader. Each passage has a reading level with comprehension questions. I like that the passages cover topics like history, science, and math! 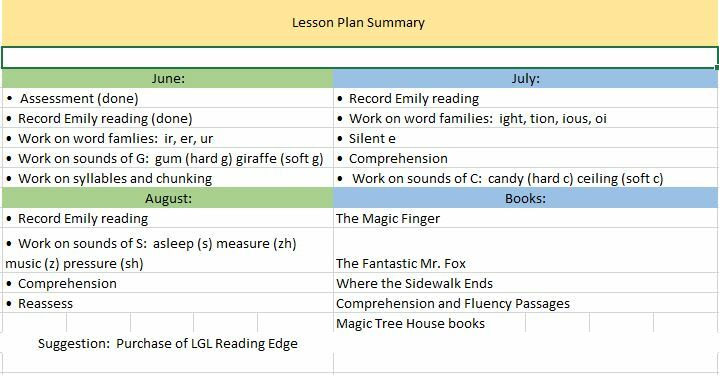 At the beginning of each week, I sit down to lesson plan for all of my students. I go through the notes and the plan summary to help me select items for the week. Each student has their own pocket folder where I'll place our data collecting sheets, fluency passages, word study sheets and dictionary, and one mini-book. I paper clip the plan to the outside of the pocket folder and keep all of the folders in a basket. Knowing when is a good time to go up a level or to move onto a new skill is a tricky one. I use data to help me make that decision. How is their word per minute on passages at this level? How did their fluency sound? What was the average rating for fluency at each of those levels? Are they improving and are the passages becoming too easy at this level? For a more in-depth tutorial on how to gather this data and move a student up, head over to Reading A-Z and read their guide.